Australians have been expressing shock after a boat filled with asylum seekers capsized on its way from Indonesia, killing at least seven people. Some 57 people, thought to be from Iran and Afghanistan, were rescued but many others are still missing. Immigration Minister Chris Bowen said he expected no more survivors. The tragedy has reopened the long-running debate in Australia about the fate of asylum seekers trying to reach the country by boat. Prime Minister Julia Gillard had tried to tackle the issue by agreeing a deal with Malaysia whereby hundreds of the asylum seekers would be processed there. But Australian courts ruled that her proposals were illegal, and she was forced to abandon them. Thousands of asylum seekers try to reach Australia by boat every year, many paying people-smugglers in Indonesia to transport them. The boat that capsized on Tuesday was sailing from the port of Cilacap along the coast to Kupang in West Timor province, a common transit point used by people-smugglers. It went down in bad weather off Java. 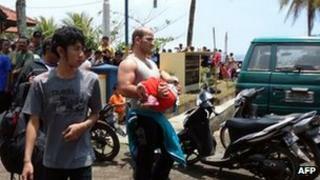 Indonesian rescue officials said seven bodies had so far been recovered and 57 people had been saved. But they expected the death toll to rise because the asylum seekers had been crowded below deck. Mr Bowen was pessimistic about finding any more survivors, telling ABC News: "I think that we can tragically assume that many, if not most, of those people who are missing will be very difficult to recover alive." He once again made a plea for opposition politicians to support the Malaysia swap deal, saying it would deter people from getting on to boats. The main opposition party wants to reopen a detention centre on the Pacific island of Nauru, a policy that the governing Labor Party bitterly opposed while in opposition.